Join our all-star mentors for a day of adventure, exploration, and fun. Read below for information about the family experience at Tu B’Shvat and for program specifics for teens, children, and sprouts. All children and teens must be accompanied by an adult. This is not a stand-alone program for youth. 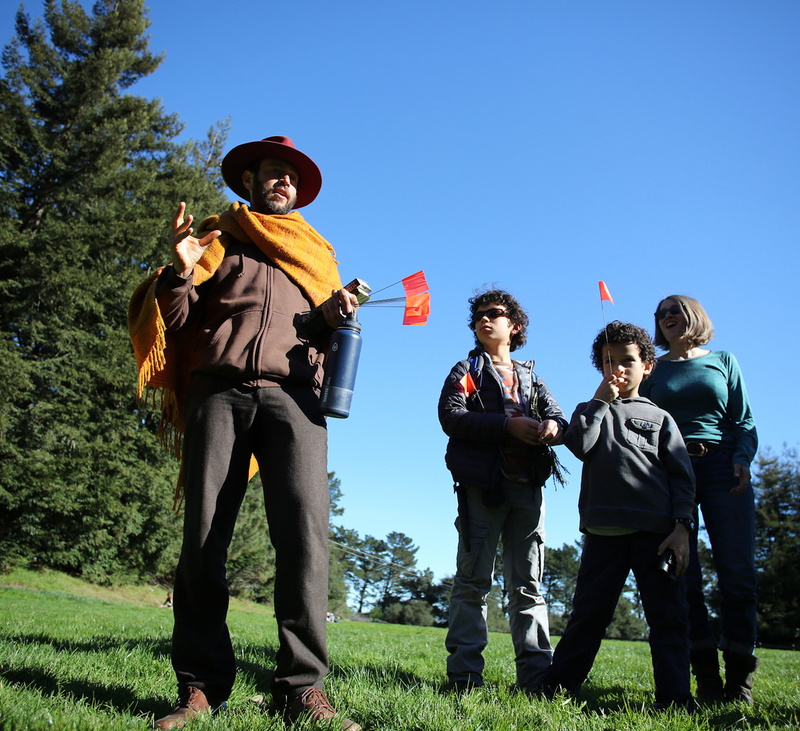 Tu B’Shvat in the Redwoods is a family-friendly event, and we encourage families to join us! We cultivate a vibrant youth village and intergenerational experience, and believe that it truly does “take a village to raise a child.” We create an atmosphere where sprouts, children, and teens receive the support they need to find their unique place within the community, and enjoy the wonders of the forest. During the community seder in the morning, experienced mentors take youth ages 4–14 on active Tu B’shvat-themed adventures, modeled after our B’hootz and B’naiture programs. There will also be a Tu B’Shvat sprout seder for ages 0–3, led by Yael Raff Peskin and their parents. Teens over 14 participate in the adult seder with the whole village. In the afternoon, all youth rejoin their family for lunch and weave into our afternoon offerings. Please see below for more information. Please note that we will provide supervision and programming in the morning, and when the seders end parents and guardians are responsible for knowing where their children and teens are at all times. Contact Us with any questions about our Tu B’Shvat youth programs. We hope to see your family in the redwoods! Read below for information on our offerings for families and each age group. We encourage families to join for the entire festival. Youth ages 4–14 will engage in active adventures in the forest for the morning and will rejoin their families at 12:30 for lunch and afternoon offerings. For the morning, youth will be split into small groups by age. Enjoy an afternoon together at one of our many family-friendly activities. There will be something fun for everyone! We invite our littlest village members to celebrate the birthday of the trees at our Sprout Corner. We’ll create a cozy space and lead activities, stories, and songs during the community seder. All Sprouts must be accompanied by a parent or guardian. 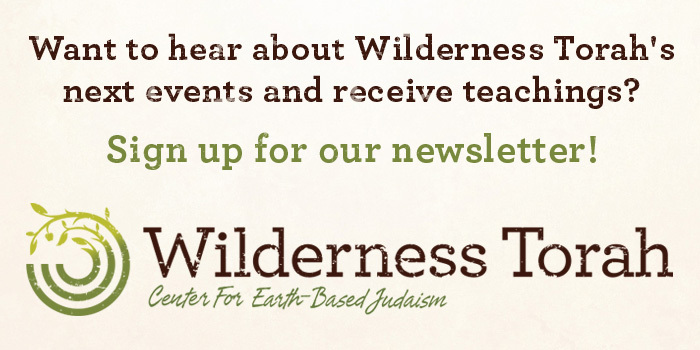 Modeled after our B’hootz Program, youth ages 4–10 enjoy seders and nature connection games led by our outstanding mentors. We provide structured activity and supervision blended with space for creative, spontaneous play. 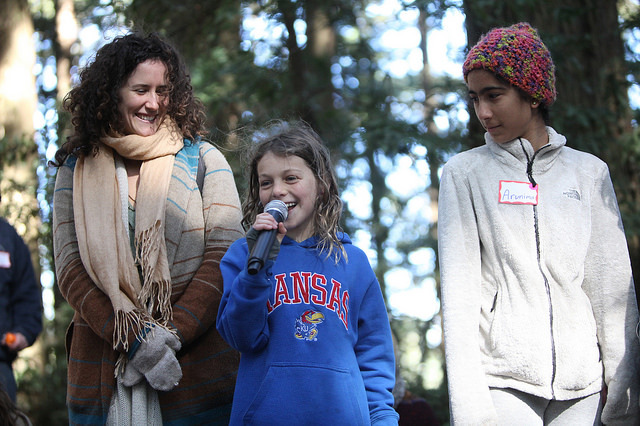 Youth will spend their morning connecting to the trees, themselves, our mentors, and each other. In the afternoon, they will rejoin the whole village for lunch and family-friendly offerings. Youth in 6th-8th grades are invited to come join our mentors for a morning adventure before integrating into the rest of the village at lunch and for family-friendly afternoon offerings. Teen Shomrim (Guardians) are invited to participate in the adult seder and offerings. If you would like to explore the possibility of your teen helping with the seder or children’s program, please inquire. Families with youth enrolled in B’hootz, B’naiture, or Shomrim receive a 25% discount off the entire family’s registration fee. Please fill out this form to request the appropriate discount code. Each year I am amazed to again feel like I’m returning home to myself, and reconnecting with nature and wonder. All this, and the knowledge that my child is feeling something similar in the youth programs!